Santa Clara gave Julio Fuentes a long-expected nudge off the dock last week, accelerating the city manager’s exit by more than two months. The decision came on the heels of the revelation that Fuentes reduced the San Francisco 49ers’ rent by $5 million without bothering to clear it with the council. While the NFL club has coughed up the three months outstanding—no doubt a bit of damage control—the team maintains that the city is getting a sweet deal. The two sides will now enter couples counseling mediation. Newly appointed Mayor Lisa Gillmor has called out city staff’s dealings with Levi’s Stadium, especially Fuentes. Her male colleagues on the council—Pat Kolstad and Dominic Caserta—finally seem to be trading in red & gold for the the city’s colors. Gillmor’s mayoral predecessor, Jamie Matthews, who oddly resigned one day after Super Bowl 50, claimed he wasn’t a football fan but enthusiastically played center whenever the team came calling. Paradoxically, the person given the boot may be the most savvy in all of this. 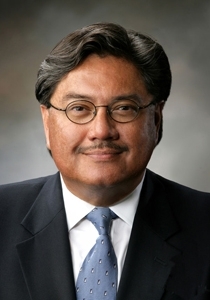 Two days before Super Bowl 50, Fuentes, a Latino, played the discrimination card. Four weeks later he announced he would resign by May 31. Meanwhile, the city launched an internal investigation and a source familiar with report’s details, delivered in closed session last week, says that all of Fuentes’ claims regarding a hostile work environment were nada. The rent dispute was the final straw. There’s a suspicion Fuentes realized the end was nigh and set his resignation date far enough out to secure another $72,000 while trying to land new employment. (Just look at this guy’s picture; he looks like he just tied someone to the train tracks.) While the 49ers’ support at City Hall is dwindling, allies still abound. In a bizarre report detailing the rent dispute, the Santa Clara Weekly decried Gillmor and colleagues’ political posturing and argued the Niners are “entitled” to a much better deal. The team couldn't have asked for a better article—unless, you know, the team wrote the article. Sounds like this guy was up to know good. The comment about looking at the guy’s picture though, Josh, that seems like a bridge too far. One could argue that it is racial because you’re looking at a picture. The case you’ve laid out, regardless of race makes a sound argument. Don’t you think that was a low blow? The Fly might’ve gone further and said the guy resembles the Frito Bandito rather than likening him to that famous Canadian, Snidely Whiplash. Anyone playing the race card becomes fair game. It appears that in the past, the city has been out-negotiated by the 49ers organization. Now the city is negotiating with Related, a very competent builder based in NY, for the massive development on the golf course. I fear that they will be out-negotiated by this organization as well. I have nothing against the 49ers or Related, they are doing the “industry-standard” maneuvers to get what they want. However, I would very much like if the city does not allow, as they did with the new stadium, the infringing of property rights of those surrounding this development. Well, with the city attorney and city manager you gotta say the city council really knows how to pick ’em! 15 years removed from my beloved birth home and nothing has changed. Sad. Follow the money, as Woodward and Bernstein wrote. @Empty Gun. Exactly. There have been rumors of money and favors accorded current and former members of the Santa Clara City Council and other city officials since the stadium was announced. Names have been mentioned but nothing ever proved. Too bad Santa Clara government and residents were bamboozled by the slick 49er and NFL organization. The promise of money and fame were just too overwhelming for the simpleton politicians who sold this mess to an ignorant constituency. Santa Clara government and residents are now the laughing stock of the Bay Area. The Levi Stadium is a billion dollar dump that even the 49er loyalists and outside venues are avoiding. Even the City of Santa Clara and 49er organization have admitted that the location is losing money. What a pity! Too funny! Greed always wins over logic and common sense. Good luck cleaning this mess up! Julio Fuentes was just in way over his head in Santa Clara. A City Manager from a small So. Cal town does not equip one with the skills or experience necessary for CM life in Silicon Valley. Sounds like he lacked the emotional and intellectual wherewithal to make up for that deficiency, as evidenced by his very poor decision making. Santa Clara Weekly will put out a story for whoever pays it the most. That paper is so bad, I wouldn’t use it to line a bird cage. Born and raised in SANTA CLARA it breaks my heart to see my beloved Santa Clara going down hill. We need old town values back in SANTA CLARA! M.Mike, I also thought the comment on the picture was out of line. Not because of race or anything close to it. Does he look like Simon Legree? Maybe the grin a little, but not good reporting. The 49ers bought the election that approved Prop J and also contributed to council campaigns. I was opposed from the start and would love to be proved wrong. If we got a good accounting on the cost/benefit of the Super Bowl I will be pleasantly shocked if the city didn’t lose money. If someone over there in Santa Clara was really on the ball this is a perfect time to make the Raiders an offer they can’t refuse. As long as the 49er$ don’t want to pay all the rent, they can share the locker room. Of course the Niners might want to make an offer of their own then. Isn’t that the way the Donald does it? Burdening the north Santa Clara residents with yet another 15 days of crowds and traffic for the financial benefit of the 1% is not the answer. The 49ers tilted the tables to get their stadium, let them pay for it. In some ways, the stadium has served as an example to the residents of Santa Clara and the city council of how not to do a deal. I’d like to see us all learn from this and move forward more thoughtfully and transparently. I’m not normally the guy that’s going to come out on the side of big government over a corporation or the people, but it was the government’s job to protect the assets of the people. In this case the tax base raised to build the stadium at the expense of the people, money was also raised by the 49ers. Money from the events held there was to go to pay off the debt incurred and make some evil profit for all three parts involved. The Santa Clara city leaders job was to look out for the interest of the people, clearly they have forgotten that in this case. Have you ever noticed how bugs runway when you turn on a light? Governments are run by people who are human and as such subject to corruption, this is why our constitution was written the way it was. We are in charge of the government. The government is not in charge of us it is there to represent, “us”. In our Declaration of Independents the reasons are pointed out for the people to dissolve the relationship between a corrupt government, and the people in charge of that government. In this case it is up to the people to revoke that trust and to investigate any wrongdoing on their behalf. People, this is a small example of why we have a system of checks and balances, the founding fathers knew governments are only run by humans, they invoked the power of God into those documents to give the people the right to recall a foul government. If government is your God, we are screwed! We don’t have to have a bloody revolution every time the people in government become irresponsible. We the people have the power of recall and the obligation to use it weather it be local, state or federal that has runamuk. When the residents of SC keep voting these real estate developers onto the city council, what do they think is going to happen? That the council members are going to look after the interests of the tax-paying residents or the interests of these huge conglomerates who dangle offers of lots of money to be made in front of them? The SC council, who was voted in by the residents, took the dangling carrot but not one of these council members had the experience, the knowledge or the guts to stand up and truly negotiate a good deal for the city with the Niners, the NFL, or any of the big-time developers looking to get a piece of this easy money. SC execs and council were eaten alive at the negotiating table every time they sat down. They never had a chance but as long as they got to sit at the same table with the big dogs and got themselves something out of the deals, they were ok with that. So now a few heads roll at the city staff and council level, who are now back-pedaling as fast as they can in a weak attempt to appear as if they were all for the residents and against these big, bad corporations from the beginning. So the tax-paying residents are the losers in this bad deal it at least they have a loser NFL team to go with it. You didn’t have to be clairvoyant to anticipate what’s currently happening. The sad truth of the matter is the vast majority of residents still have no idea what’s going on and would probably chose to re-elect everyone on the council. I find it very humorous that Jamie Matthews endorsed Mike Honda while Lisa Gillmor has endorsed Ro Khanna. Both candidates proudly promote them on their websites. Seems like each candidate’s endorsers reflect the integrity and ethics of the candidate himself. Just like Matthews is no longer Mayor of Santa Clara, I do not expect Honda to be the district’s congressman in DC much longer either.